In general, mixing tops and shoes with skinny jeans, may not seem such a big problem. However, I thought about giving you some ideas about how to wear skinny jeans with boots in the cold weather. These examples will help you to adapt to your preferences and needs. My aim is to cover different designs of footwear and show you how to wear skinny jeans in winter. I encourage you to keep some of these ideas at hand for inspiration on both your working days and fun weekends. Whether you have a moderate selection of “pieces de resistance” in your wardrobe or it’s time to make an inventory of tens of jeans designs you own, I advise you to spend a few minutes analyzing your stash. Remember how to wear skinny jeans with short boots or ankle boots or high knee boots. 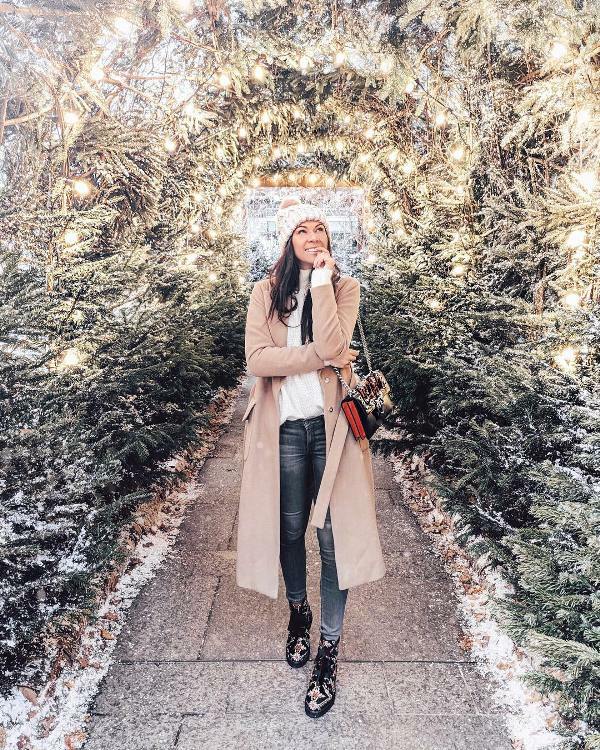 This is the secret to be able to wear your favorite denim items all through the cold weather season. Seasonal footwear like sandals, mules and athletic shoes are best shoes to wear with a pair of skinny jeans during summer. However, wearing numerous casual shoes like: sneakers, converse or even over-the-knee boots is not conditioned by the temperature outside. Take a modern and adventurous approach to your clothing style by experimenting with a few of the cute outfits with skinny jeans below, complemented with the best boots to wear with skinny jeans! No matter which are the jeans designs you prefer, chunky heel or flat boots are a ‘must have‘ accessory for the cold season. Light tones are perfect for the warm and dry days whereas black or dark grey is a reasonable option for the wet and moody period. 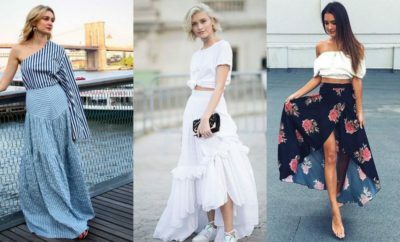 When it comes to heels, adapt your style to various occasions and create different outfits for going out or date outfits for drinks, or, why not, interesting festival outfits for women . 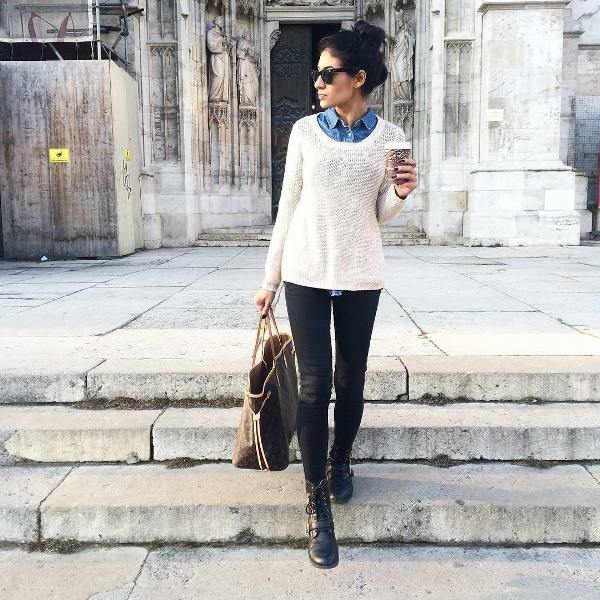 Learn how to wear skinny jeans with boots. At work, sport the loveliest high-heel leather, suede and even velvet booties. For casual events enjoy the comfort flat combat or wedge classy designs offer. As you see skinny jeans look super-voguish when matched with these staples. Some of the pictures below, are a good inspiration for creating also winter club outfits. Let’s see some ideas about how to wear skinny jeans with ankle boots. Wondering how to wear skinny jeans with flat boots? These three next images might be the perfect inspiration for you. Weather you like wearing black, or maroon or bright colors, you will find beautiful outfits to copy this winter. There’s not much in the winter boots department that hasn’t been presented on the catwalk. So you have tens of footwear designs to choose from and create cute outfits with skinny jeans! How about keeping the textbook style cold season accessories like leather or suede elegant or casual boots and adding a few extras like a pair of cutesy camel boots and even ugg boots. I know, I know….ugg boots are tricky and seem horrible creations to some of you! 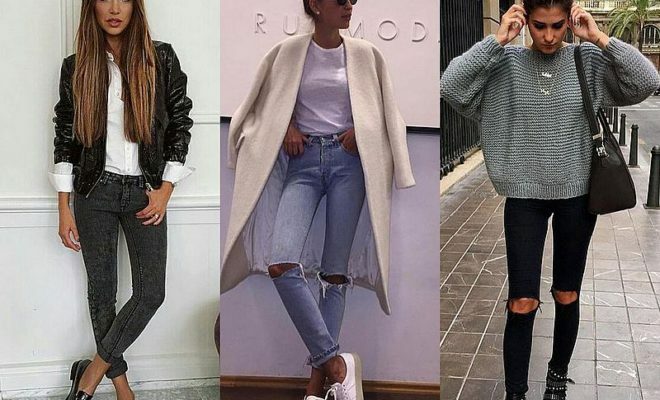 However, why don’t you take a look at this ideas about how to wear skinny jeans with short boots and use these outfits as an inspo. Isn’t it, against all odds, super-stylish? It’s true this is not a winter clubbing outfit but I still find it stylish. You could always dress like that if you are looking for a first date outfit winter. Probably you’ve seen celebs walk around in boyfriend jeans and ugg combos, however I prefer the neat looks (I mean skinnies) instead of the baggy and sluggish sets. Aiming high when there are plenty of trends to embrace is so much fun. Polish your clothing style by adding a few cool and feminine details. Over-the-knee boots turn heads irrespective of the occasion. Be brave and strip off your prejudices with these winter outfits if you don’t know what to wear to a nightclub in winter! Forget about patent leather, instead, limit yourself to designs sculpted from velvet or suede and make a memorable impression with some cute outfits for dinner. Also, I advise you to keep the rest of your outfit simple, unless you don’t want to create jeans outfits for parties. Let these style goodies speak for your unique taste! In order to achieve the visual leg lengthening effect wear cute outfits for summer with jeans in combo with boots over the knee. I do not recommend these boots for cute business casual outfits for women, but I sure do recommend them for a winter night out outfit. I’m sure you know the feeling that you are simply bored of putting on your pants and the same pair of shoes over and over again. Huh! 🙁 I decided to write this article and line up all these cute ideas about how to wear skinny jeans with boots in order to revive your passion for mixin’ and matchin’. That is in fact, the key to love your style and have fun while experimenting with clothes and creating new clubbing outfits with shorts , or jean shorts outfits or cute outfits with skinny jeans. Accessories have the power to free you from monotony and help you get back in the fashion game! 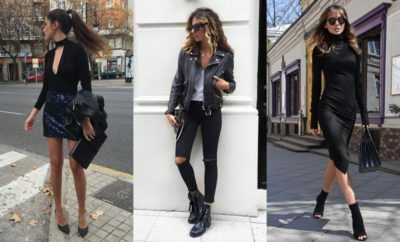 Whether you are a fan of high-heels or you refuse to torture your feet and you try to wear flats as often as possible, you’ll find hundreds of amazing outfit ideas about how to wear skinny jeans with boots, that you can easily recreate. No matter your budget, you’ll be able to complement your boyfriend, flared, straight or skinny jeans with the coolest and trendiest sneakers, boots or slip-ons. Next time you wonder what are the best shoes to wear with any pair of jeans come back to us!